I literally had a student ask me this during a retreat last year. Being a hip youth pastor, I asked, “what on earth does that sentence mean?” He explained that he had high-stake streaks going on his snapchat account that he didn’t want to break. His phone was out of service and my phone had the camp wifi, so he was begging me to help him rescue his dying streaks. There was authentic urgency in his voice. Apparently he had steaks that were over 300 days long. I am not a monster, so I let him use my phone. I supervised him as he sent black screens with just the fire emoji to two of his friends. Ticking both of those streaks up a single notch. Snapchat has made people obsess over streaks. They wear them like a badge of honor. Simply put, this is when you consistently snap someone every day over a long period of time. Each day gets tabulated on a little number next to their username positioned next to a fire symbol. It’s apparently a big deal. However silly a snapchat streak seems, I do think it points to a powerful principle in life — your streaks will either lead to success or a mess. Every day, your students are building up both positive and negative momentum. We want to give you the tools to help them start daily disciplines that lead to lasting change. In this series, we are challenging students to commit to three spiritual disciplines every day: reading the Bible, prayer, and community. Every big victory starts with small wins. These streaks will help them build positive momentum, grow closer to Jesus, win in other areas of life. Together, they will explore what a healthy prayer life looks like, how to read their Bible without getting bored, and how healthy friendships will take them far. 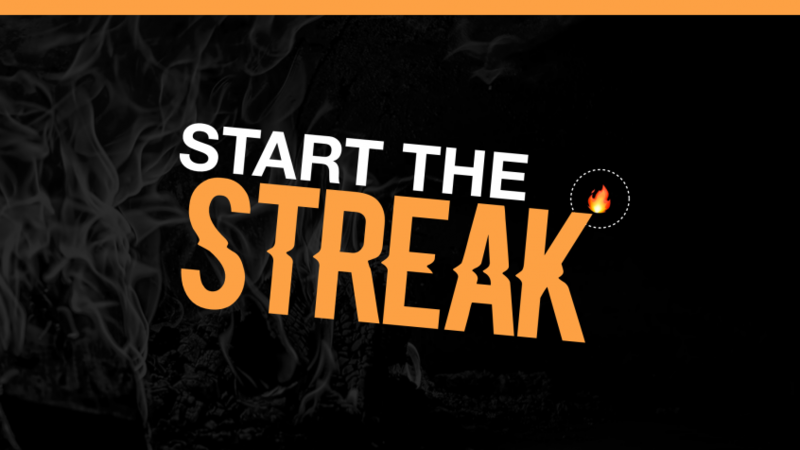 We hope that you can encourage your students to start the streak & keep them going. You can download all three sermon scripts using this link — no subscription necessary. — Plus access to our entire ministry library which includes hundereds of free resources.